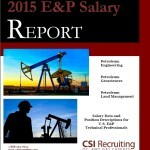 This week CSI Recruiting will publish their 11th annual E&P Salary Report, complete with base salary and cash bonus data, paid time off and stock program figures. As always, the report includes extensive commentary on industry hiring and compensation trends, all broken out into nine specific skill sets within the petroleum engineering, geosciences and land management disciplines. Typically published in early April, this year’s report was purposely delayed in order to better understand and report on the impact of our industry’s dramatic slowing, as we watched oil prices decline by 50%+ in 90 days from September to December. As we prepared to publish on our usual schedule, prepping the report in Mid-March, we saw oil take another decline, this time into the $45 range. We made a decision to pause the report’s release, uncertain whether oil was headed even lower, and as hiring was at a virtual stand-still. Thankfully, oil recovered , hitting $60 and increasing 30% in the subsequent two months. With that increase, so returned hiring and, as important, optimism. Out of the doldrums and with a modest level of hiring and acquisition activity returning to the market, we chose to ‘put a bow on it’ and publish the report with this updated commentary. For those frustrated with the status of the report in weeks following the typical publication date, we apologize for the delay. That said, we stand firm that a full digestion of the current marketplace and its resulting commentary will make the report more useful. To tease the results, we’ll say this – in short, salaries and bonuses have moved very little, largely due to layoffs and hiring freezes. In other words, if you stayed employed in a fulltime job during this downturn, your compensation has changed little. If you fell victim to a reduction in force, it was your absence from the payroll that allowed for your still-employed colleagues to hold steady. We hope you participated in the report, and if so, you’ll receive your copy via email this coming week. Thanks for your patience!